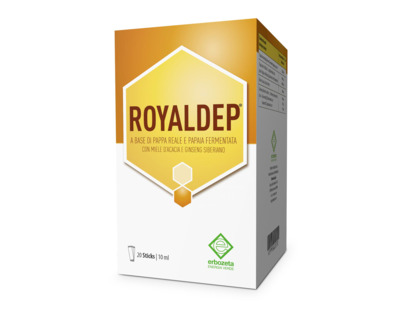 Royaldep® is a food supplement based on ROYAL JELLY and FERMENTED PAPAYA, with ACACIA HONEY and SIBERIAN GINSENG, useful to provide an additional quantity of these ingredients to the daily diet. Fermented Papaya, Royal Jelly, Acacia honey, Siberian ginseng. Take 1 stick a day, pure or diluted in a drink.